Ready to join us at MIT this summer? You can begin an application online. MITES students leave campus with the skills and confidence to succeed in science and engineering. We are able to offer MITES free of charge because of continued support from our generous funders. 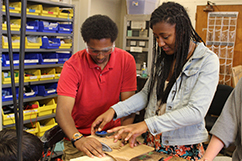 Minority Introduction to Engineering and Science (MITES) is a rigorous six-week residential academic enrichment program for rising high school seniors – many of whom come from underrepresented or underserved communities – who have a strong academic record and are interested in studying and exploring careers in science and engineering. This national program stresses the value and reward of pursuing advanced technical degrees and careers while developing the skills necessary to achieve success in science and engineering. The 2019 MITES program will be held June 22- August 2, 2019. Upon acceptance in mid-April, students should email summerapp@mit.edu if they have concerns about program dates conflicting with their school calendar. Students take one math course, one life sciences course, one physics course a humanities course and an elective course. Placement into the math, life science, and physics courses is determined by diagnostic tests that are administered to all students during the orientation period of the program. The MITES Calculus I course begins with the coverage of several Pre-Calculus topics: Triangle and Analytic Trigonometry, Graphing Techniques, Binomial Theorem, Complex Numbers, Vector Analysis, and Limit Theory. Then the Difference Quotient, Definition of Derivative, Rules of Differentiation, Applications of Differentiation, Differential Equations, Fundamental Theorem of Calculus, and Applications of Integration. The assessment process includes six problem sets, a mid-term exam, and a final exam. Each student is assessed for effort, comprehension, resilience, and compatibility with the rigors of an Engineering program. The MITES Calculus II course is a continuation of the study of single-variable calculus from both theoretical and applied perspectives. The course begins with a thorough study of the theory and applications of integration, including the Fundamental Theorem of Calculus and several techniques of integration, such as substitution, integration by parts, trigonometric substitution, partial fraction decomposition, and integration of trigonometric functions. The course then continues with the study of L’Hopital’s Rule and its application to infinite limits and improper integrals. The course concludes with an introduction to sequences and series, including various tests of convergence and divergence. Throughout the course, students are encouraged to understand the mechanics of calculus in addition to questioning the theory and assumptions that underlie the subject, both in individual and collaborative settings. Past Topics for this course have included Linear Algebra and Differential Equations. The MITES Biology course is an introductory, undergraduate-level course emphasizing the fundamentals of genetics, biochemistry, molecular, and cell biology. The class includes a lab and a group project culminating in a presentation on a genetic disorder. Problem sets and exams ask students to apply the material and concepts taught in class to real world biological problems and to interpret and explain experimental results. MITES Biochemistry is the advanced life science course in the MITES program. This course surveys intermediate and advance topics in both biology and chemistry, beginning with a review of thermodynamics, acid-base equilibria, and basic molecular interactions. Students then move on to review the fundamental concepts of the central dogma; explore the behavior of enzymes and bioenergetics; and conclude with an overview of the ways in which biochemistry has profoundly influenced our understanding of human health, disease, and disease intervention. Students are required to read and summarize journal articles related to topics covered in class, so that they can practice reading scientific literature and gain additional exposure to contemporary research methods. The MITES Chemistry course covers in significant depth many of the core concepts of general chemistry: bonding, structure, equilibrium, kinetics, and thermodynamics. Students complete problem sets, lab activities, exams, and short papers, and each and every assignment emphasized and assessed analytical thinking, deep conceptual understanding, and reading comprehension. The MITES Physics I course is a non-calculus-based class that covered topics in kinematics, the Newtonian laws, impulse, and momentum, all in six weeks. The emphasis in this course is on understanding the concepts first and then applying those concepts to solve real-life problems. The problem sets and exams are rigorous and challenging for students who have had high school physics and for those who had not yet taken physics. The MITES Physics II course is an investigation of basic mechanics (kinematics, forces, energy, momentum, rotation), circuits (electric fields and forces, basic circuit components and combinations) and geometric optics (refraction, lenses, ray tracing). The MITES Physics III Course covers concepts ranging from harmonic systems and simple harmonic oscillators with an emphasis on the nearly universal applicability of the simple harmonic oscillator in the perturbative regime for physical systems to steady state damped and driven harmonic motion and transient phenomena. Physics III is taught at approximately the level of a sophomore college physics course on vibrations and waves. After covering the vibrations portion of the course the class may cover various topics in special relativity ranging from time dilation, the Lorentz transformation, and velocity addition, to relativistic dynamics. The MITES Humanities course offers students an introduction to college-level critical thinking and argumentative writing. The course is divided into two units: “Race, Ethnicity, and American Identity”; and “Science and Ethics.” Readings come from various genres; and work for the course consists of several short writing assignments, an in-class presentation, one formal academic essay and its revision, one personal essay and its revision, and a final group presentation. MITES Architecture Elective is an introduction to architectural principles, exploring relationships between the human body, form, function, materials, and environment. MITES Architecture Elective introduces fundamentals of composition, design processes, representational media/methodologies, craftsmanship, graphic/verbal communication, and analytical thinking. Upon completion of the MITES architecture elective, students will possess elemental design skills to: 1. Objectively analyze and evaluate architectural issues and form opinions for the cultivation of design ideas. 2. Refine an understanding and ability to control, a logically reasoned design process using iterative study and self-evaluation/editing. 3. Evolve a self-directed design and problem-solving process. 4. Establish a problem-solving process for working with and within groups. 5. Understand and develop a proficiency in programmatic, environmental, formal and technical architectural content. 6. Feel comfortable using an ever-increasing variety of representational media to communicate one’s design ideas. 7. Hone skills in the use of two-dimensional and three-dimensional representational techniques in the physical and digital realms. 8. Develop an understanding of the relationship between physical materials, structural systems, construction methods and our experiences of the built environment in everyday life. 9. Gain experience in oral and written presentation skills. 10. Be exposed to elemental and fundamental principles of: design, technology/practice, history/theory/culture, design communication, and urbanism. The MITES Computer Science course for Summer 2018 was Machine Learning. In this course, students learn about effective machine learning techniques. Students not only learn the theoretical underpinning of machine learning, but also gain practice in implementing and applying these techniques to new problems (e.g. self-driving cars, speech recognition, robust search engines, understanding the human genome). For their projects, students team up to create websites that make predictions for everyday problems using machine learning and artificial intelligence principles. The MITES Electronics elective course covers college-level electrical engineering material through hands-on labs and lectures. Some topics covered include combinatorial and sequential logic, semiconductors, RC circuits, filtering, operational amplifiers, solar cells, electrical power consumption, feedback, control theory, and even some embedded systems, as well as a general history of electronics. In addition to the conceptual work and labs, the students take part in an extremely demanding final project where they form into two-person teams and are tasked with coming up with an complex electrical device to create, which they the must subsequently design, construct, and debug. The MITES Engineering Design elective course teaches students a creative design process, based on the scientific method, with lectures and the creation, engineering, and manufacture of a remote-controlled machine. Students learn to identify problems and create, develop, and select the best strategies using fundamental principles, appropriate analysis, and experimentation. Students then divide their best concept into modules and develop the critical modules first. The class is based off of MIT's 2.007 competition, which is normally taken by mechanical engineering sophomores over a semester. Recent years have seen the students making increasing use of Arduino microcontrollers and various sensors to program autonomous behavior in their robots. The Broad Genomics course explores the emerging field of human microbiome research. The human microbiome refers to the bacteria and other microbes that live in or on us. The course focuses on the bacteria that colonize the human body and on the techniques used to identify and characterize these bacteria. The students take an in-depth look at types of bacteria colonizing specific locations of the human body and learn how these bacteria can affect our health.